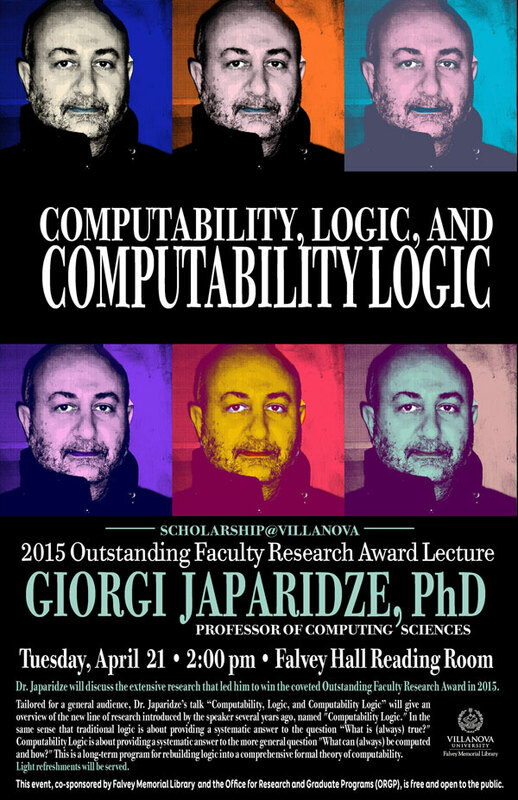 On Tuesday, April 21 at 2 p.m., an Outstanding Faculty Research Award lecture featuring this year’s recipient Giorgi Japaridze, PhD, professor of computing sciences will be held in the Reading Room of Falvey Memorial Library. Dr. Japaridze will discuss the extensive research that led him to win the coveted Outstanding Faculty Research Award in 2015. Tailored for a general audience, Dr. Japaridze’s talk “Computability, Logic, and Computability Logic” will give an overview of the new line of research introduced by the speaker several years ago, named “Computability Logic.” In the same sense that traditional logic is about providing a systematic answer to the question “What is (always) true?” Computability Logic is about providing a systematic answer to the more general question “What can (always) be computed and how?” This is a long-term program for rebuilding logic into a comprehensive formal theory of computability. Light refreshments will be served. This event, co-sponsored by Falvey Memorial Library, the office for Research and Graduate Programs (ORGP), is free and open to the public. To read up on Dr. Japaridze’s topic of research, check out the links below, selected by science librarian Alfred Fry. Game Semantics for Linear Logic? Dig Deeper resources provided by Alfred Fry, science librarian.